LORALANA "ALANA" LIGHT has been decorating, staging and managing both residential and commercial projects for the past 20 years. You can see her work throughout the United States and Canada. Moving every two years growing up, while other kids played sports Loralana was rethinking furniture placement and rearranging rooms. Instead of going to brunch after church, her family would peruse model homes. Thus began her lifelong love of beautifying the home. INSTRUCTOR: Not content to just do, but wanting to share what she has learned, Alana has extensive experience teaching adults and designing specialized curriculum. She has taught positive, uplifting workshops empowering people to have the homes and lives they've always wanted. Since 2002, workshop attendees in Arizona, California, New Mexico and Texas have loved her enthusiastic, "you can do it" teaching style. RADIO TALK SHOW HOST: She was asked to guest host a Santa Fe real estate radio show. Shortly after she was offered her own weekly show appropriately entitled Make Your House a HOME. What started as a few hundred local listeners exploded into an internationally heard show, with over 172,000 podcast listeners in under two years. 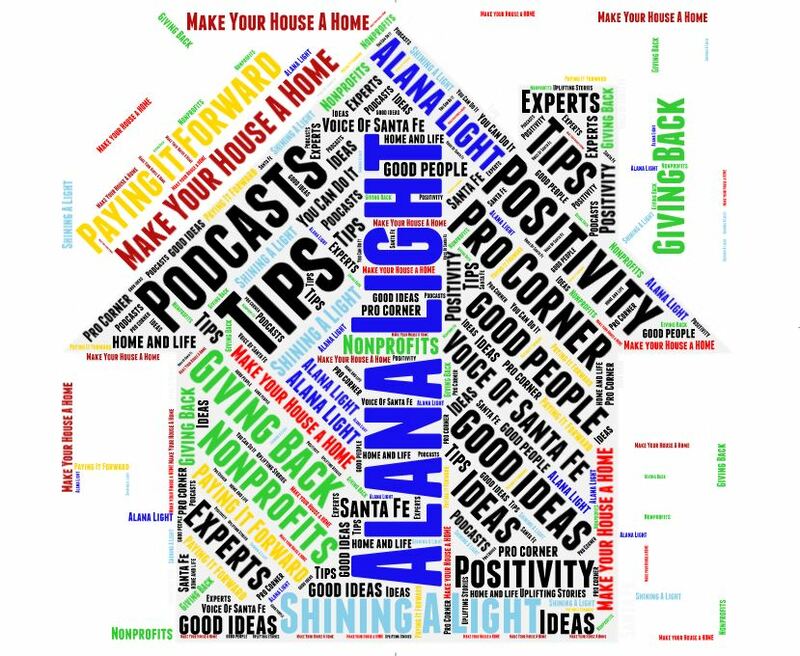 From Atlanta to Australia..... from Indiana to Italy, listeners worldwide respond to her home tips, interviews with subject matter experts and uplifting nonprofit guests, exemplifying humanity at its best. 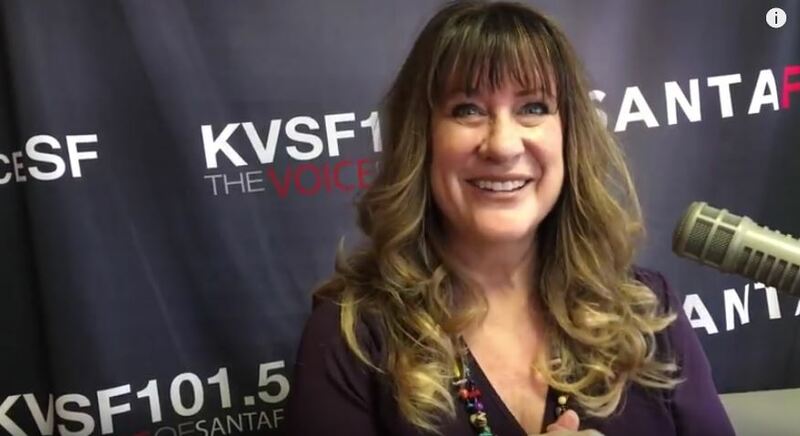 ​IN THE NEWS: Alana has been a guest on the "Financial & Real Estate Hour" on 770AM KKOB Albuquerque.. She's also addressed decluttering and organization for the home on Albuquerque's "Gray Matters", broadcast out of 94.5 FM and 770 AM-KKOB. She has talked about Staging on the "The Realty 1 Hour" broadcast. She has been featured on ​KRSN Los Alamos, and in the LA Daily Post. Alana's work was also cited in the Santa Fe New Mexican regarding her design of the First National Bank tree on the historic Santa Fe Plaza. "You are an angel.... a joy fairy, sprinkling magic into a tortured world. Your spell has left me intoxicated with optimism." "Thanks again... It was so fun to "shop my house" and come up with two very workable and livable main rooms. A good friend stopped by (the next evening) and she said the living room felt like we'd knocked out a wall or something, because it seemed so much more roomy. We're really enjoying the new arrangements!" ~S.G. "I very much enjoyed your class and the decorating ideas. I would love to take any other class you teach, and I'm willing to come to Santa Fe if you're teaching!" ~N.B. "Words cannot express my appreciation for your efforts transforming my home​... From the bottom of my heart and from my soul - thank you, thank you, thank you!" ~R.C. "I had the privilege to work with her... She is a True Talent and she took on my house like it was her own. She completely remodeled and decorated this house. She decorated my Casita as well. She took an empty house and not only decorated it but also completely furnished it. After five years, the house and casita remain the same. I’ve changed nothing!!! Every time I have guests, they are in awe of the decorating of my home. Like I said, she is a True Talent and was outstanding to work with." ~J.C. ​"Watching you work your magic, I feel like I had a golden ticket ... and went through the chocolate factory with Willie!" services - her technical expertise and knowledge in the field, coupled with her humor, collaboration and negotiation skills, makes for a WINNING process & outcome!" "The third home (she did for us) included choosing wall paint colors for a home on Phoenix.... My husband & I completed her questionnaires so she could assess our wants / needs for this particular home.... I basically told her "how I wanted the room to feel." I trusted her to know my taste, and she came through like a champ. She also selected tiles for the kitchen backsplash .. AND created a remarkable design." ~C.S. ​​"You are a delight to work with." ​"You are just amazing! Your enthusiasm, knowledge, experience, and witty way of teaching made the four-hour workshop a breeze. I'll attend more of your workshops when I see your name!" ~Y.Y. "Your knowledge helped in every aspect of the decorating of my home; your classes were so valuable. Your positive attitude gave me so much encouragement to continue on my own, and I can never thank you enough for all your help." ~H.H. "Thank you so much for the class. You are really such an engaging teacher. I learned so much and you made it FUN!" ~K.H. "If you're teaching, I'm signing up!" ~R.A. ﻿"She has helped us with two of our houses. After she staged our home for us, it sold promptly. Her design eye is so good the buyer wanted to purchase all the furniture! In our next home she effectively guided us through the design process, allowing us to express our own taste. She never pushed or dominated; she really made decorating our home easy and fun. No matter the budget, small or large, she is comfortable at all price points. ﻿"Alana's communication style and personality is perfect for those of us who have spouses who think a decorator means work, paint, and dollar signs! PLUS, her ability to send pictures, diagrams, color schemes, websites to shop, all make it ﻿easy to use her services wherever you live﻿, and, on your time schedule - AMEN! Alana is wonderful at using what you have versus buying everything new. She listens to what you want and then gets to work designing multiple options. Her eye for energy flow, in particular, sets her apart from any other decorator I've used. Your room, home, office, whatever, "feels" right and you are excited when the project is done. Even my "doubting" husband stated how good everything looked and felt when we were done!" ~G.K. ​"You don't just decorate. You helped us LOVE our home." ﻿"Providing information about which builder options could be acquired more economically.... your advice because of your experience, makes this seem doable. Providing information about which options we should let the builder do.... very valuable information... Great ideas! Like electrical in the floor, pocket doors, extra lighting, even rotating the house to improve the view... You (saw) things we would not have seen and asked questions we would not have thought of... I guess I would call it providing peace of mind!" ~L.S. "Thank you for a very interesting and informative workshop yesterday. I learned so much from you! preparing my house for sale." ~Y.Y. ﻿"I want to recommend Alana. She was one of our first teachers at Lifelong Learning.... She teaches each person to be their own designer, empowering homeowners to express their own personal style. Her audio- visuals as well as hands-on active class participation makes her a popular teacher in our community for all things related to design." ~P.N. ​"I enjoyed the workshop very much. (Alana) really demonstrated her knowledge and expertise. She is very approachable too. Not all stagers or designers have your very open personality." ~D.C.